All landscapes are the perceptible product of a dynamic combination of abiotic (geological substrata), biotic (flora and fauna) and anthropic (human activities) elements that convert the whole into a social and cultural amalgam in a continual state of evolution. The landscape is thus both a physical reality and the cultural representation that we make of it. It is the visible external physiognomy of a certain part of the Earth’s surface and the individual and social perception that it generates—a tangible geographical entity whose interpretation is intangible. It is both the signifier and the signified, the container and the contents, reality and fiction. That is, it has a physical, material dimension and a spiritual, symbolic and perceptive dimension. Human societies use their cultures to transform original landscapes into cultural landscapes that are characterised not only by certain types of constructions, for example, but also by the translation of human values and sentiments onto the very landscape. 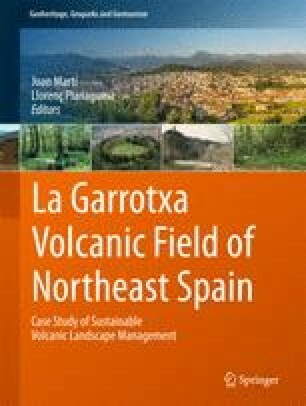 Thus, the volcanic landscape of La Garrotxa is a paradigm as it encompasses and concentrates all these ingredients in a highly singular fashion that render it attractive on both a European and world scale.